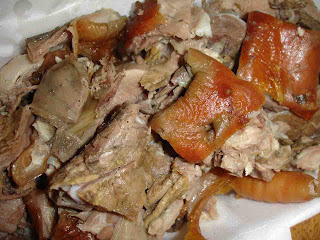 i guess when one is in manila, one can't expect to taste cebu lechon here unless of course you order from CNT in cebu and have the lechon flown here in manila..
as for sabroso lechon, hmmmm.. its flavorful alright.. but i miss the crunchy balat (skin).. and i find it too flavorful for me.. maybe something is wrong with me.. more salty and there's a sour tastes.. based on the photo that i saw on the internet, they add tons and tons of tanglad (lemongrass) inside the lechon to make it flavorful. the one delivered to me (yes, they deliver per kilo) contains some sampaloc leaves.. as for the sour/salty tastes, could it be sinigang mix? hmmm... i know that some people use sinigang mix when making roast chicken. 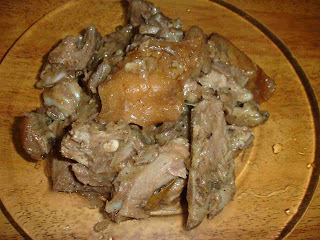 they rub the sinigang mix liberally on the skin and crevices of the butchered fowl..